As a certified eDocumentation software vendor, we’d like to help make the process of becoming a Full-Service Mailer as straightforward as possible, and have put together the following reference guide. Step 1 – Access the USPS Business Customer Gateway, to set up your business account and mailing profile. Step 2 – Get a Mailer ID (MID) and Customer Registration ID (CRID) which will be used for the Intelligent Mail barcodes that you will need to use on your mailpieces and any container labels such as sack tags, tray tags and pallet flags. Step 3 – Subscribe to a certified eDoc product that allows you to submit postal statements electronically to PostalOne!, the web-based portal for submission of your postal documentation. The Mail.dat module for SmartAddresser 5 does just that. Step 4 – We highly recommend taking the time to submit test eDocumentation through the Test Environment for Mailers (TEM). We have seen that most reasons why test mailing submissions fail are due to human errors, as opposed to software issues, so we strongly encourage you to use TEM for practicing electronic postage submission. Step 5 – Once you have successfully completed the TEM process, you can now start submitting your mailing information through PostalOne! 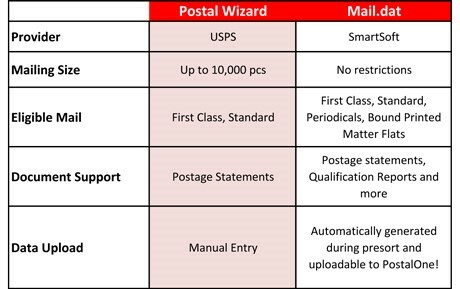 The Postal Service is promoting the use of the Intelligent Mail barcode because it expands the ability to track individual mailpieces and provides customers with greater visibility into the mailstream. It combines the data of the existing POSTNET™ and the PLANET Code® barcodes, as well as other data, into a single barcode.